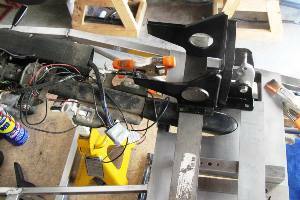 We haven't had a lot of time to work on the Locost this week, but we still managed to make a little progress with the brakes and steering. 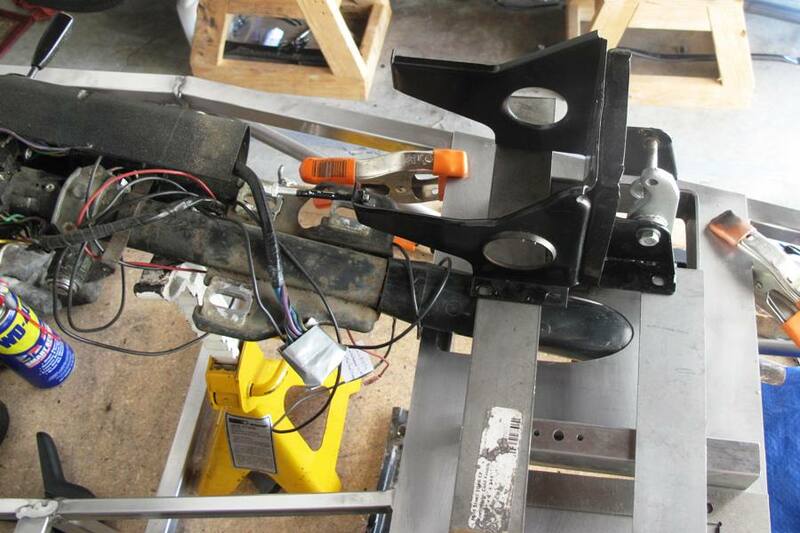 We trial fit the steering column in the Locost along with the pedals, and the results were mostly good. As expected from our design sketches, clearances are very tight, only about 1/16" or so between the column and the pieces surrounding it. But we think that's okay. The steering column is soft and covered with vinyl, so at least there won't be any metal-to-metal contact if things flex a little. In the excellent news category, we were able to fit the 3-1/2" steering column flange through our 2-1/2" opening in the engine bay shelf by trimming just 1/8" off the flange. We were worried we'd have to chop off a lot more, since 3-1/2" is bigger than 2-1/2", but with a little sleight of hand we managed to slip it through. This means we'll be able to make a really solid steering column mount, and use all three bolt holes on the flange. I know that's not a big deal for you, but it's these little things that keep us going. 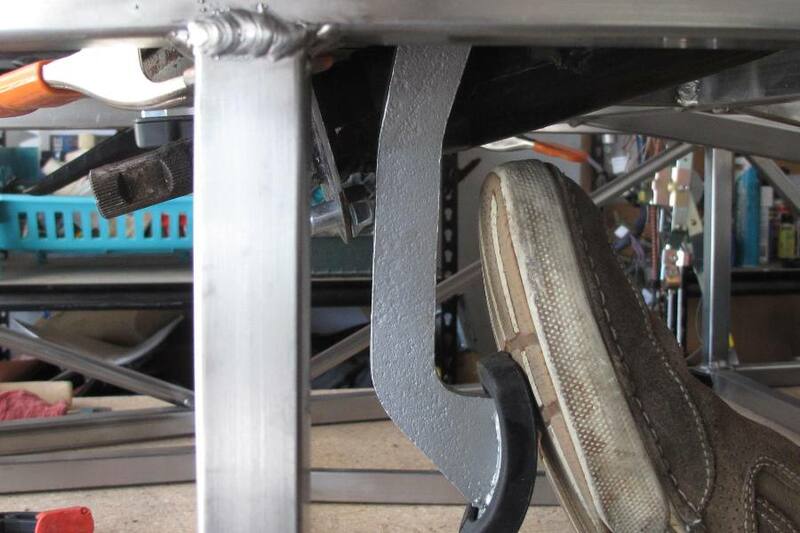 In the not-so-hot news department, the flange further restricts the throw of the brake pedal. It's bad enough that the pedal swings directly back into the flange, but it hits right where the flange bolts to its platform, so the bolt head protrudes into the path of the pedal. We can probably get away with moving the pedals back another 1/4", but any spare master cylinder clearance we had earlier is all used up. Still, I think we'll be okay. 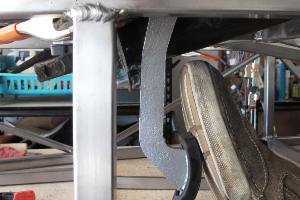 If we ever have a brake pedal that completely compresses the master cylinder, we've got more problems than just pedal clearance. 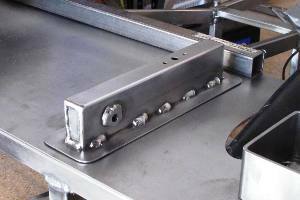 Another thing we did this week is convert our throttle pedal box into a bolt-on unit, by stitch welding a 3/4" flange all the way around the base. This of course took considerably more work than if we'd just welded the box directly to the engine bay shelf, and it's not actually attached yet, but we think it's going to look pretty cool. Besides, the bolt-on box is a huge improvement over a welded box because it's a) removable, b) adjustable, and c) we didn't destroy the engine bay shelf in the process, which definitely would've happened if we tried welding anything to it. Now that we've reached the point in this project where we're building stuff we've never built before, having something work first time out of the gate is a huge bonus. Normally it takes at least three tries to get a new part right, and that's if you're good. Which is one of the reasons we plan to use as many parts out of the M.G. as possible. Even then, I think we've proved we have the necessary skills to make a mess out of mounting parts, so we think the fact that we managed to line up three pedals with approximately correct spacing in the driver's footwell around the steering column is a big deal. Also on the plus side, we had another welding breakthrough, which was a little surprising because I thought we were getting pretty good. But I was welding up the pedal box when I noticed I could suddenly see really well through the very top of the helmet lens. I thought maybe it had something to do with the helmet faceplate, but it turned out that my glasses had slipped down a little, and I was actually looking over the top of them. So much clearer without the glasses! So now I take them off before I weld, and I can really see the details of the wire, the puddle, and everything. And once again I'm wishing I could go back and start over from the beginning on the frame.